I have mixed feelings about the killing of him. There's little doubt he worked to kill innocent people, and that's sufficient to be glad he's dead...and I am. On the other hand, I have some sympathy for the argument that his killing was extra-legal, and that we have a new precedent that dangerously expands state power. Glenn Greenwald has been the clearest and most rational voice on this. If we accept detention without judicial oversight, torture, and execution, all without any real legal safeguards, we will lose our civilization. There's good reason to be extremely cautious. But on the other other hand (we're back to the first hand, please note) it's also not so obvious that this killing was extra-legal. It's clear that al-Awlaqi worked to kill innocent people; at least, there's plenty of publicly available evidence for this. (Yes, yes, I know, it is all a conspiracy... he was framed by the NWO. But then, he didn't exist anyway, that's part of the conspiracy, so don't get your tails in a twist, conspiracists.) So for rational skeptics, here's the question: when would the the police justified in shooting an escaping murder suspect? My answer is that if there is reasonable evidence that an individual is indeed a participant in murder, and is reasonably expected to continue murdering, and they are making efforts to be beyond reasonable efforts to capture, then those are certainly sufficient conditions to justify shooting. So far as I can tell, Anwar al-Awlaki's actions satisfied all these criteria. For those who disagree, at what point, then, does it become unreasonable to let him go? Side-by-side comparison makes it clear. She'd probably make a better president, too, as she's certainly as intelligent and coherent as he is, a good deal less vicious, and far more photogenic. 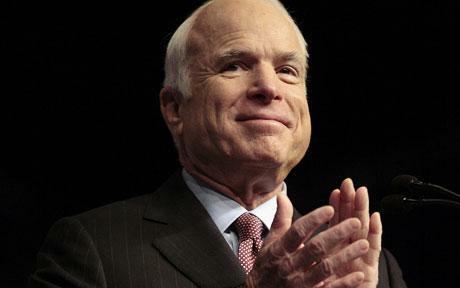 Breaking News: Al Qaeda supporters defend McCain against KGB! Wow! This is not something "we" at Unforeseen Contingencies would ever have predicted: the Chechen Jihadist website is defending U.S. Senator John McCain! It seems McCain's comments that the Arab uprisings should be a lesson to tyrants elsewhere, e.g. Russia, have some Duma members calling for criminal charges against McCain. Kavkaz Center labels the Duma members "KGB," which is probably more or less accurate. We here at UC have, on various occasions, condemned all three of the parties involved here, but in this case, we certainly endorse Sen. McCain's comments, and if KC supports McCain's position, well, we endorse that too. My friend Fran Zelenitz finished in 26hrs49min36sec! (My calculation.) She was the 42nd finisher. The race ended less than an hour ago, so it's still unclear how many finished, but this surely puts her in the top fifty percent. She really burned up the course! She texted me from the finish and was soooo excited! Me too! Shake and bake, Fran! Update! Fran was 42nd out of 175 finishers, putting her in the top 24%! Awesome performance! My good friend and running partner, Fran Z., starts the Bear 100 Mile trail run a few hours from now. She's excited and ready to rock, but I think not as excited as I am. Fran on Indian Ridge, MT. The ISI is finally fingered as a perpetrator of Jihadist terrorism. Abbas is about to, umm, throw a monket wrench? Roll the dice? Throw a "Hail Mary?" Start a war? in the Middle East. The candidates of the Lunatic Party are fighting it out for the chance to battle Obama in 2012. (That's not an endorsement of Obama, you know.) "Don't ask, don't tell" just ended. Qaddafi is finished. Syria and Yemen degenerate. The eurozone prepares to collapse. The U.S. budget wars re-erupt for no apparent reason. I sometimes don't like the columns of NYT's Roger Cohen, but he has written a very thoughtful and thought-provoking one just ahead of the tenth anniversary of the 9-11 attacks. I recommend it. On September 11, 2001, I was in Kyiv, Ukraine, teaching at the EERC Masters Program in Economics. I had gone downstairs to the office of our director to discuss some matter. When I entered his office, he looked up from his computer screen "My God, an airplane has just struck the World Trade center in New York. I was checking some share prices on the Paris Bourse, and it just came across the news ticker." "Was it an accident? Intentional? An attack?" "It doesn't say. No other details at all." He stared at his screen a moment. "My God, a second plane just hit. That answers it." I've never paid that much attention to architecture, but the twin towers of the World Trade Center were my favorite manmade object to look at. When I was in grad school at NYU, I could see it from the shower in my apartment in Queens. I used to study til 4:00 or 5:00 AM, have a shot of Jack Daniels, and stand in a hot shower gazing it, and then go to bed. To me, it symbolized what human reason can accomplish when set free, and made feel the world is good. 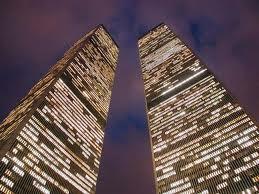 The last time I saw the WTC was the end of August, 2001. We were in NYC, just south of NYU (Washington Square), at night. We went to a Brazilian restaurant and then wandered around, with the towers looking like they were almost overhead, all lit up, even though they were a couple of miles away. I was utterly shocked when it was destroyed -- I confess it stunned me more than hearing about the people who died, but then I'd seen, touched, and entered the WTC many times. So far as I know, no one I knew died on 9-11. One of my close friends lost some of her economics students, but I think there are at least two degrees of separation between me and those who were murdered. I mourn them, regardless, and am sorry they were murdered. Are we really supposed to have a theory about what happened? My theory comes from a couple of articles in Foreign Affairs, written by people who would know. Bin Laden was outraged when the Saudis chose the U.S. coalition to expel Saddam Hussein from Kuwait instead of choosing Al Qaeda (he'd offered) and declared the U.S. presence the greatest offense to Islam ever. He attacked because of this offense, but his real goal was to provoke a war that would lead to a schism in Islam and cause Muslims everywhere to rally to his side and his theology, so he could establish a new caliphate. He failed. And for all the terrible problems that ensued from his destructive and irrational doctrines, and the often also destructive and irrational responses to him, the world remains good. 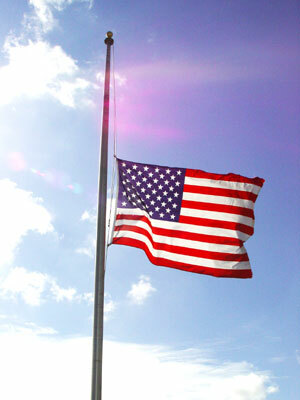 Unforeseen Contingencies will have a post or two to commemorate the victims of the 9-11 attacks in the next day or two. But for now, here's a very nice rebuttal of some of the "Truther" conspiracy nonsense, by Chris Mohr in eSkeptic. Thanks to James Randi and his JREF blog (James Randi Educational Foundation) for highlighting it.